In 1964 Denver Water Authority developed a 23-mile long aqueduct to draw water from Dillon Reservoir to serve Denver’s needs. During the 1980s the authority installed a six megawatt horizontal hydroelectric generator at the end of the tunnel, utilizing Roberts Tunnel as a penstock. After start-up, performance problems were encountered with the unit, specifically, generating capacity was limited due to excessive vibration. Initial investigations determined that part of the problem was shift in rotor position. The Water Authority monitored rotor position during normal operation and determined that the axial movement of the rotor grossly exceeded the endplay of the thrust bearing. In addition, significant oil leakage from the bearings was an ongoing problem. Upon disassembly of the machine for inspection, severe damage was discovered in the turbine. Rotating and stationary components showed heavy wear due to axial contact during operation. Two bearings were used in this system, installed on either end of the generator, with the turbine overhang. The faulty bearing was mounted between the turbine and generator and functioned as a combined thrust and journal. This bearing was enclosed in a stand-alone housing fastened to a common bedplate. The non-drive end was equipped with a self-aligning, plain, fluid film journal bearing. Essentially, the same type of journal bearing was used on the drive end of the machine. Non-equalizing fluid film thrust pads were attached to the end of the journal to function as the main thrust bearing. The other end of the journal shell was babbitted to form a plain babbitted thrust face and serve as an inactive or "bumper" bearing. Self-aligning capability was accomplished with a spherical interface between the thrust/journal bearings and the housing. With this arrangement the spherical bearing mount accommodated radial journal loads and axial thrust loads. The Water Authority set up a static test to evaluate the thrust/journal assembly. Axial load was applied between the bearing shell and housing and relative movement was measured. It appeared that significant movement was caused by the housing expanding due to the shallow spherical bearing mount. It was obvious that this condition had allowed the rotor to shift and cause the rub in the turbine. Kingsbury, Inc., Philadelphia, PA., was contacted to help analyze the problem and provide recommendations. Kingsbury’s Repair & Service Division assigned one of its service engineers, Gerry Abrams, to visit Denver Water’s facility in October 1993. It was agreed that the bearing arrangement was not adequate. A replacement bearing was proposed which would eliminate the spherical bearing mount and provide a rigid bearing seat with straight shoulders for the axial thrust load. The thrust bearing function and journal bearing function would be independent, in the new design, with a self-aligning/self-equalizing system for the thrust bearing and an articulated journal bearing. This would be adapted to the existing housing with a casing that would form a “drop-in” bearing cartridge. Bearing housing modifications would also be required. Denver Water had also determined that the thrust load of the machine exceeded the rated capacity of the original thrust bearing, which was rated at approximately 56,000 lbs. It was estimated that the actual load was 160,000 lbs. Denver Water specified that the retrofit bearing must have the capacity to accommodate the greater thrust load. 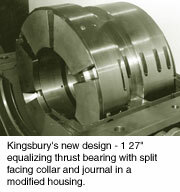 Kingsbury, Inc. proposed a larger diameter main thrust bearing with more operating surface area. This would also require a two-piece replacement thrust collar which would be adapted to the original thrust collar. The Water Authority accepted the design proposal and authorized the manufacture of the retrofit bearing assembly with the stipulation that the project must be completed in a very short time to meet the scheduled completion date of the outage. The original bearing assembly was returned to Kingsbury’s Repair & Service Division where the housing was modified and details of the retrofit were rapidly designed and manufactured Within one month the project was completed and returned to the site, ready for installation. During installation, field support was provided to help with critical phases of assembly and start-up. Since the rework, the unit is no longer restricted by bearing-related problems and has been a reliable source of power. Even with the high level of knowledge and abundance of design tools available, cases such as this will occur. In the affiliation of different types of rotating equipment, performance, reliability and maintenance problems may not be realized until field conditions are encountered. Often, a weak bearing component will limit the entire system or enhanced bearing performance will allow increased productivity. Kingsbury, Inc., founded in 1912, developed the original tilt pad fluid-film thrust bearing, and has been responsible for introducing most of the design innovations in these types of bearings throughout the years. Kingsbury operates a facility in Philadelphia, PA., which designs and manufactures bearings for larger and custom applications; a high volume manufacturing plant in Oshkosh, WI. ; and a Repair and Service Division in Hatboro, PA., a suburb of Philadelphia, to provide on-site and factory rework for fluid film bearings of any brand. In addition to manufacture and repair, the company regularly responds to customers’ needs for quick turnaround design and engineering, routinely saving customers the expense of costly downtime. Kingsbury maintains a commitment to field service, providing on-site diagnostics, repair and supervision for Kingsbury and non-Kingsbury bearing installations, with a dedicated staff of field personnel.